Today is day one of our move out of Pennsylvania--Sol is currently there supervising the move out while the boys and I try to stay cool in Little Rock. 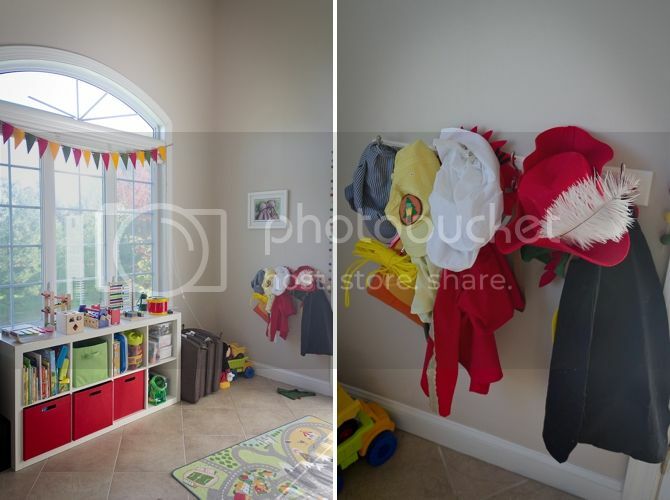 It seemed like a good day to blog about my other favorite room in the house--THE PLAYROOM!!! 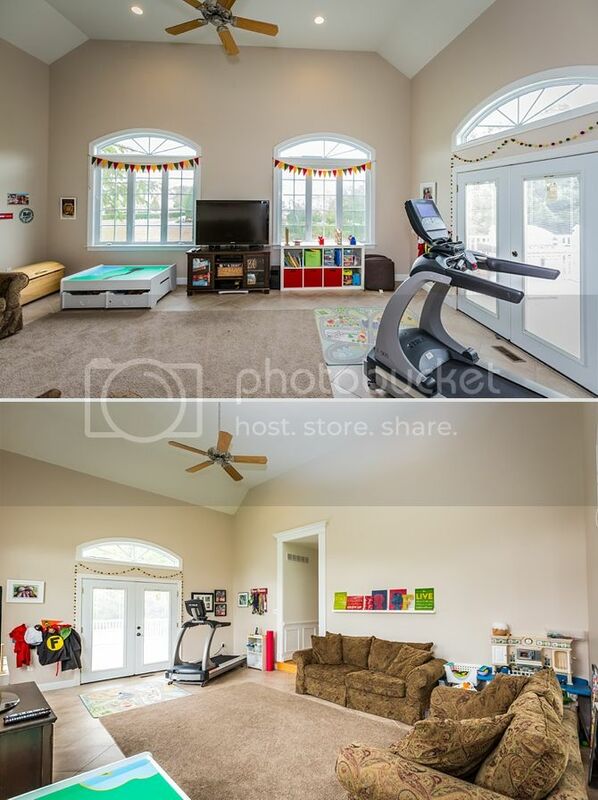 We like to joke that the playroom is all of the furniture from our Virginia house--the couches and entertainment center all went here and we bought new stuff for the main room. 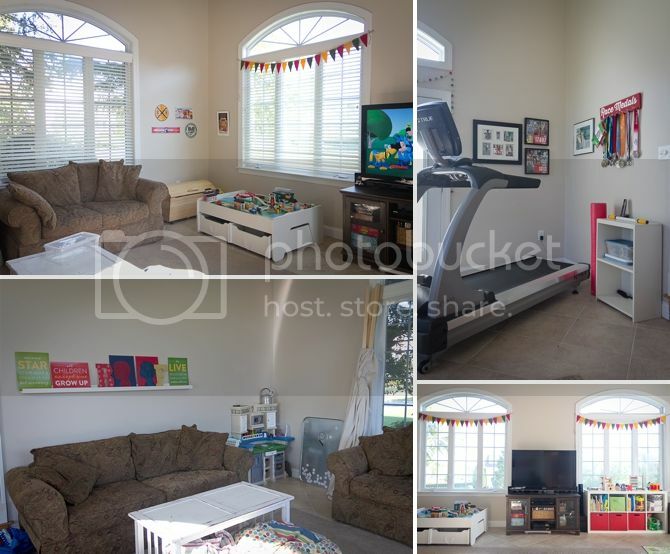 The technical name for the playroom is "the conservatory" and we like to joke about holding recitals or doing whatever you do in a conservatory there. It was such a lovely room--big windows on three sides and lots of sun! It's on the far end of the house where the boys could make a huge mess and I could ignore it and not feel the need to tidy it up when people came over. I've run outside twice in Pennsylvania--triple jogging strollers didn't exactly sound like fun. I've logged almost all my miles on our new treadmill. I love the little running corner I set up--with all our medals and a few marathon related collages. The playroom is slightly Peter Pan themed--only because I reused the decorations from Finley's birthday party and printed some quotes to put on the little picture ledge. The costume corner is also a favorite--because sometimes you just need to be Captain Hook. Or a Wilderness Explorer. Or a chef. Or a conductor. I took these pictures probably six months ago--when my sweet Keaton still hated tummy time. Let's not even talk about how he's on the precipice of being ONE. I see the train picture!